Changes in the elevation of ancient shorelines on Mars may have been caused by the emergence of the Tharsis volcanic region, suggesting large bodies of water formed early on the Red Planet. If Mars had oceans in its ancient past, their shorelines likely changed as the Tharsis volcanic region rose up on the Red Planet, new research shows. By contrast, past work suggested that oceans must have formed only after Tharsis began affecting the orientation of the Red Planet's axis roughly 3.7 billion years ago. Mars is an enigma to researchers because there is extensive evidence of water long ago — gullies, rocks formed in water. But the vast quantities of water that are thought to have once been found on Mars have disappeared. Much of it may have escaped out of the atmosphere, which thinned as the sun's pressure pushed lighter molecules out into space. The oceans, if they existed, could also have retreated underground. Robert Citron, a Ph.D. student at the University of California, Berkeley, is lead author on the new research, which is published in the journal Nature. He said the InSight mission that will soon head to Mars could search for underground water. "InSight will place a seismometer on the Mars surface and it's possible — it's not the main goal of the mission, but possible — that the seismic signals could indicate the presence of frozen underground water, or even possibly, liquid water aquifers," he told Seeker. Scientists have long suspected that oceans once existed on the Red Planet. 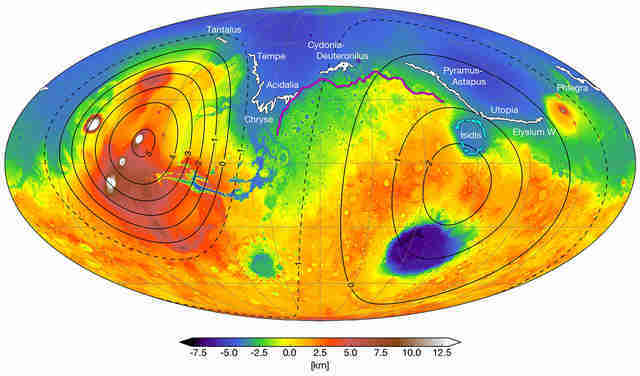 Altimeter data from the now-defunct Mars Orbiter Laser Altimeter aboard the Mars Global Surveyor revealed low-lying areas on the Red Planet with possible shorelines. Those shorelines, however, had great changes in elevation. That's not something we seen on Earth. The growth of Tharsis volcanic region, though, may have pushed the shorelines out of alignment. But before investigating that theory, Citron and his team had to resolve a point of disagreement in past research. Tharsis is a very massive spot on Mars, so massive that it likely caused the planet to change its axis orientation as the volcanoes grew. In turn, that changed the height of the shorelines from a smooth plane, to the more jagged altimetry seen today. Tharsis lies at the equator, but was likely located somewhere else in the ancient past. A 2007 model of the shorelines, which sought to reconcile their varying heights, suggested Tharsis caused an axis migration of as much as 90 degrees of arc. However, that didn't match up with later observations of Tharsis’s geological history. If Mars had a different axial tilt, then somewhere on its surface would be a fossil "bulge" caused by the planet's rotation widening the center of its mass. Researchers located what they believe is the fossil bulge in 2010 by looking at the signatures of the Martian magnetic field. Using gravity data from Mars, they subtracted the effects of the current rotational bulge, as well as the effect of Tharsis. What was left showed a possible fossil bulge. If true, the Martian axis likely only migrated by 20 degrees. Citron's new model, which focused on the purported shorelines for the Deuteronilus and Arabia oceans, suggests Tharsis indeed affected the shorelines' alignment, but only if the volcanic region and the oceans grew at about the same time. 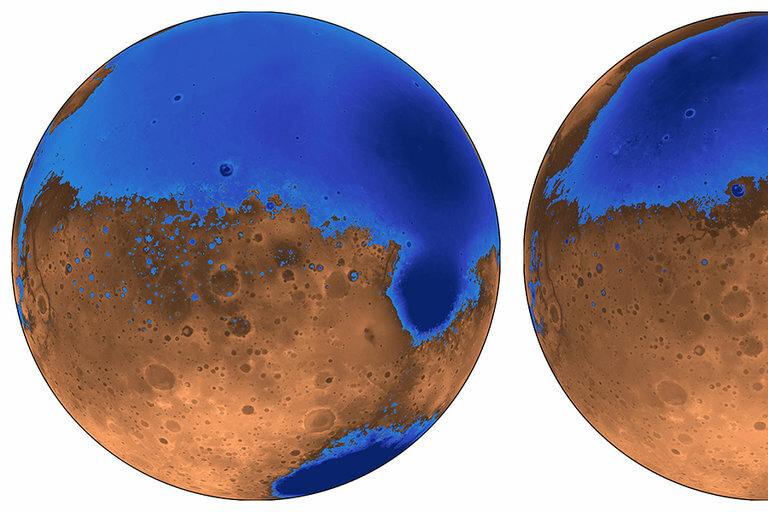 As Tharsis grew, shifts in Mars's axis and geology would have impacted the ocean shores. Arabia's shoreline began forming roughly 4 billion years ago, and Deuteronilus about 3.6 billion years ago. Based on examining their shoreline development, the new model suggests Tharsis emerged about 3.7 billion years ago. Citron added the researchers wonder if the oceans persisted for long periods of time or only temporarily when Tharsis volcanoes were particularly active. "It's a hypothesis," he said. "More accurate dating and mapping of the shoreline could either validate or refute it. We aren't directly involved in the identification and mapping of the shoreline. We just look at their deformation. If more shorelines can be mapped and dated, then we could compare it with our model. That would be an interesting thing, to further examine the history of possible oceans."